Jesska Denise: The Sunday Post : A Life Update. The Sunday Post : A Life Update. It's been quite a few days since I last posted on here. It's a pitiful excuse really but my wifi is so bad at the moment. It's incredible that we're in the year 2013 and moving 5mins out of a town can have such a dramatic impact on your internet speed. We're looking at different options but nothing really fits. Eircom seems to be the best option out of a bad bunch so if any of you can recommend one, please comment below. I took advantage of the college wifi during the week and uploaded pictures for new posts and I finally just got the chance to sit down and type. The end of October brought with it some exciting things. I got a job at the local cinema and started last weekend. I was so unsure of how the interview had gone but obviously it was better than I thought and here I am two weeks later with the job. Between college, assignments and work my blog will unfortunately suffer for the next while until I can get into a new routine. October was a fantastic month stat wise and I really want to keep that up. I also hit over 100 likes on my facebook page which is incredible and if you haven't 'liked' already, make sure you do :) In other news, this week I turn 21. Cray cray. Especially as I'm constantly mistaken for a lot younger, 16 was the latest. I can't wait to hang out with friends and family and eat my body weight in cake and chinese. What better way to celebrate the big 2-1. Things are crazy right now but it's a fun crazy. The house is finally starting to come together after moving in at the end of September. College is going good and I can finally blame my extreme tiredness and excessive bruising to anemia (again). I've been buying a few things the last week or two, so expect a haul post or two. I'm also psyching myself up to start filming youtube videos too. Where I'll find the time is a whole other issue. But yes, keep an eye out for those and make sure you're subscribed. Hope you're all having a good weekend. I've been pretty out of the loop over the past six weeks or so, so you're not the only one - seems to be a busy time of year all round! I'm going to sit down tomorrow and film lots of videos and take lots of blog photos to get me back on track. Hope the new job is going well and that you're getting there with the uni work! Your new place looks lovely - the candles make it look so cosy and inviting, just lovely! I have no time to blog these days! Such a busy time! 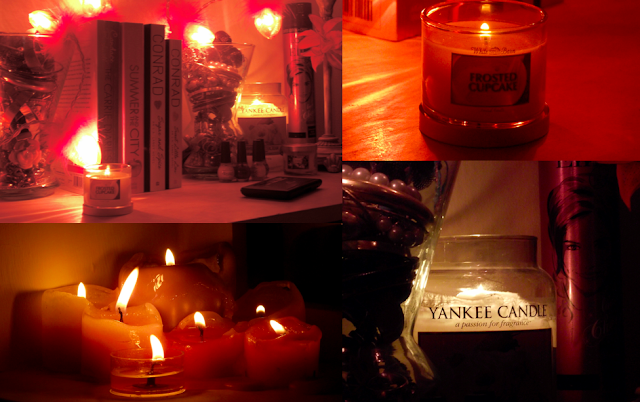 and I love all the candles!